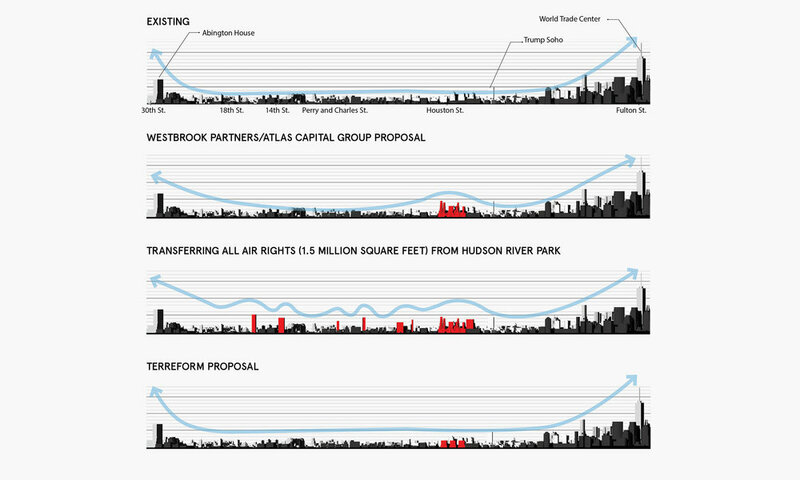 In July 2016, Terreform was approached by a representative of Manhattan CB2 for its opinion about a proposed development at 550 Washington Street and the facilitating transfer of 200,000 square feet of air rights from Pier 40, a critical community asset. While we are generally supportive of adaptive re-use or rebuilding on the St. John’s site—and had earlier suggested it as a potential location for the expansion of NYU — we found this proposal both over-large and too narrowly planned to fully leverage the opportunities presented by the site and to fulfill the obligations of such a massive undertaking to a neighborhood in the course of dramatic transition. Our study believed it deficient in a number of areas, and our research considered alternative scenarios.